green color long fruits, tolerant to virus and disease, high yielding, perform well in all the seasons. good keeping quality. We are a renowned name that is actively committed towards offering qualitative Hybrid Bhindi Seed. 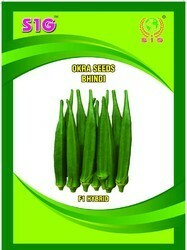 Our provided Hybrid Bhindi Seed is available in various packaging options for our clients. 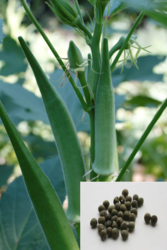 We are offering a best quality assortment of Bhindi Seeds, which are taken from us in safe packaging. Suitable for early and rainy season sowing. Fruits 5-6 inches long, 5 ridged, dark green in color, first picking after 40-45 days of sowing. - Tall plants with good branching. - Attractive glossy green pentagonal fruits. - First harvest is ready after 45-48 days of planting. Early maturing (40-42 days) hybrid shows very good tolerant to YMV in rainy season. Very strong plants with dark green forked leaves average plant height of 120-150cm. Fruits are five ridged, dark green color, average fruit weight of 10-12 gm. - First Peeking : 45 – 55 days after sowing.